Political elites have used social engineering to control masses of people and territories over the millennia. They have redrawn borders and moved tribes and herded people into harsher environments, not ideally suitable for human habitation and agriculture; they have sent humans to occupy already heavily populated areas through invasion, conquering them, destroying the local inhabitants’ religion in the process, and forcing them to accept the conquering religion of Islam. Christians organized their own crusades in response, to regain the territories occupied by Muslims. Many borders have been erased or redrawn as the result of greed, war, war reparations, communism, colonialism, Nazism, Islamic conquests, tribal wars, and other politically and economically driven search for land, natural resources, drinking and irrigation water, navigable water, oil, diamonds, and precious metals. In the 21st century, the technocracy and the global elitists have pushed the social engineering much further, by planning to erase all national borders and destroying sovereignty in order to allow free massive migration of peoples around the globe, and by redistributing wealth from the haves to the have nots, regardless of effort. The British found out that borders are important and chose to vote for Brexit, the exit from the mammoth technocratic experiment called European Union, a state-like federation controlled by Germany. Angela Merkel invaded her own people with Islamist “refugees,” men of military age who have left their wives, mothers, elderly, and children behind to fight their tribal wars in Syria, while they slashed and burned across Europe, in order to eventually conquer thousands of years of Christian civilization through demographics and the politics of multiculturalism. Nations want borders, people want to identify with their ancestors, their history, their families, their language, and their native ancestral lands where their heroes lay buried, where archeological remnants of their glorious past can be found, catalogued, and displayed in museums, a collective shrine to our human civilization. People are drawn to those with a common bond that establishes where they came from and exemplifies the long and arduous history of survival against all odds. Most people are fascinated by their own genealogical roots and spend time and resources to find out where they came from. Others hyphenate their names to identify with the continent where their ancestors came from. The desire to belong to your own kind is exemplified by the tragedy that took place 76 years ago at the border between today’s Russia and Romania. On April 1, 1941, on the day of the Holy Easter, a large column of villagers, who were fed up with the Soviet utopian exploitation, attempted to cross into Romania. They were massacred not far from the Romanian border, men, women, children, and grandparents, by machine guns and swords of the Soviet cavalry at Fintina Alba. The Soviets had installed a new border in June 1940 between USSR and Romania, cutting large chunks of Romanian territory and annexing it to the Soviet Union. The Red Army had occupied Basarabia, northern Bucovina, and Hertza in the military campaign of June 28-July 4, 1940, an area of almost 20,000 square miles with a population of 3.8 million people. Ready to occupy it with a full-scale invasion, the Soviets gave Romania an ultimatum on June 26 but the Romanian Army, in order to avoid military conflict, agreed to withdraw from the territories. Germany knew of the Soviet interest and remained silent. France, guarantor of Romania’s borders, fell. This emboldened the Soviets to issue the ultimatum of surrender. Thus a large part of Moldova became, on August 2, 1940, part of the Moldova Soviet Socialist Republic, encompassing most of Basarabia, and part of the Ukrainian Soviet Socialist Republic, now the breakaway Transnistrian state. The Hertza region and other regions inhabited by Slavic majorities in northern Bucovina, northern and southern Basarabia, became part of the Ukrainian Soviet Socialist Republic. Those who objected to the Soviet occupation were politically persecuted, arrested, deported to labor camps where few survived, and executed. In January and February 1941 massacres took place at Lunca in the region Cernauti, and in spring 1941 at Fintina Alba, in Poiana Varnitei (Varnita canton). About two km from the border, Romanians, who wanted to return to their motherland and their ancestral lands, were murdered by Soviet soldiers. Villagers had written letters, asking the new Cernauti authorities to allow them to return to their country. 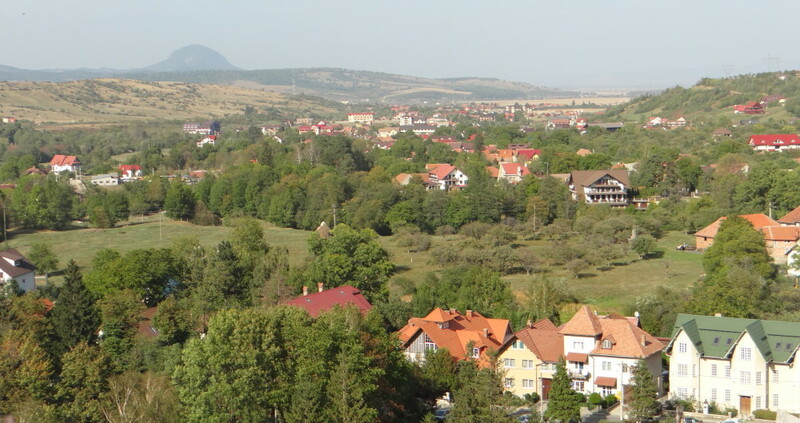 In March 1941, the villagers of Storojinet also petitioned to return to Romania, but the requests were denied, and the villagers returned home. They made the fateful decision to leave on the rumor that the Soviet authorities would allow them to cross the border unharmed, and they would be able to rejoin the Romanian families left behind. The villagers of Patrautii de Jos, Patrautii de Sus, and Suceveni went to church, prayed for a while, raised a white flag to show that their intentions were peaceful, and over 1,500 people joined a long procession, marching to turn in their requests to be allowed to return to their motherland, Romania. An investigation made in 1943 Bucovina, with the help of eye witnesses, discovered the names of 26 martyrs who died on that fateful day, April 1, 1941, in Fintina Alba. A monument called “troita” was erected on the site by Ukraine in 1991, following its installation to power after the dissolution of USSR. The journalist Ion Dominte, writing in the newspaper “Bucovina” about the massacre at Fintina Alba, left a historical record of the events. The mass deportations of Romanians that took place in the first year of installation of the Soviet regime in this area came to light. Petru Grigor suggested that archeological digs should take place today, to find out the true number of those who were killed. Orthodox Church pilgrimages with prayers and wreath-placing ceremonies take place every year “in memoriam” of those who sought freedom at all costs and did not wish to live under the Soviet boot across the border from their national roots. This entry was posted in History and tagged 1941, April 1, borders, Bucovina, Cernauti, Fintina Alba, granita, massacre, Petru Grigoriu, Soviets, Ukraine, USSR by Admin. Bookmark the permalink.